"Like all really nice people, you have a weakness for detective stories...The least that I can do is write you one." So wrote A. A. Milne to his father, to whom he dedicated this delectable mystery. Mark Ablett's stately mansion, the Red House, is filled with very proper guests when his most improper brother returns from Australia. The prodigal brother enters Mark's study, the parlor maid hears arguing, and the brother dies-rather suddenly, with a bullet between his eyes. The study is locked from the inside, and Mark is missing! Investigating the crime is wealthy Antony Gillingham, who rivals Sherlock Holmes in his remarkable powers of observation. He is aided by his friend, Bill Beverley, a cheerful young man in white flannels. Echoes of Christopher Robin and his friends chime nostalgically throughout this charming classic of detection! 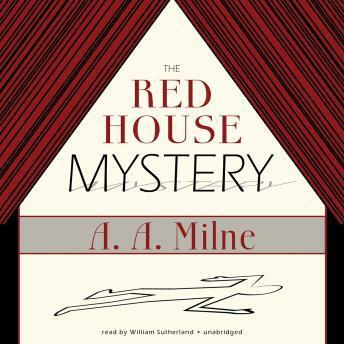 This is a classic British mystery with an eye to the satiric and a wink at Sherlock Holmes. I enjoyed the narration and the examination of the amateur detective's thought process.